What would this Big Ten matchup look like in TBT 2019? Two of the hottest teams in the Big Ten do battle on Tuesday evening when No. 5 Michigan makes the trip to Evanston, Illinois for a matchup with Northwestern. While this promises to be a great game, just imagine these two facing off in TBT 2019. On one hand, you have a Michigan program that has reached the NCAA Tournament seven of the last eight years, including a trip to the national championship game in 2018. Over in Illinois, a rejuvenated Northwestern squad awaits after reaching its first NCAA Tournament in school history in 2017. Whether it’s reuniting with former teammates or overcoming old demons, TBT is all about second chances. That’s exactly why Chris Webber is a no-brainer to coach a Michigan alumni team. Despite being the leader of the Fab Five, earning Naismith College Player of the Year honors in 1993, and helping bring the Wolverines to two consecutive national title games, Webber’s infamous timeout against North Carolina is the lasting image of his college career. That could all change with a TBT title. 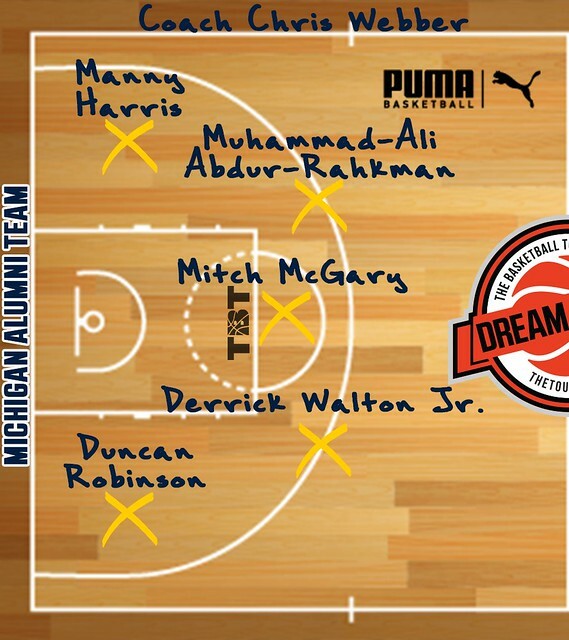 Two other guys looking to overcome heartbreaking NCAA Tournament losses are Muhammad-Ali Abdur-Rahkman and Duncan Robinson. The duo led Michigan to the national championship game last year, where they were blown out by juggernaut Villanova. Abdur-Rahkman is currently in the G-League after finishing his Michigan career with a program-record 144 games played. Robinson, who is the only player in college basketball history to play in both a D1 and D3 national championship game, is one of the best 3-point shooters in Michigan history. He has a bit of TBT experience on his side as well, having served as assistant coach for Big X in TBT 2018. Rounding out the starting five is a trio of Wolverine legends whose careers in maize and blue span from 2007-2017. The oldest of the three is Manny Harris. Over the course of his three-year Michigan career, Harris became the fourth UM freshman to score over 500 points, set a program record for most free throws made by a freshman, was named First-team All-Big Ten in 2009, and logged the second triple-double in school history against Northern Michigan. Harris has since won championships in China and Greece. Although he’s currently a professional bowler, big Mitch McGary would be a terrific choice to man the middle. A highly regarded yet raw talent out of high school, McGary put together a masterful two-year college career which culminated with him being drafted 21st overall in the 2014 NBA Draft by the Oklahoma City Thunder. Lastly, don’t think we forgot about Derrick Walton Jr. A Detroit native who was named Michigan Gatorade Player of the Year his senior year of high school, Walton is the only Wolverine with 1,000 points, 500 rebounds, and 400 assists in program history. He also holds the program record for most assists in a game (16), and was named the Most Outstanding Player of the 2017 Big Ten Conference Tournament. After spending last season with the Miami Heat, Walton is playing with the EuroLeague’s BC Zalgiris in Lithuania this year. When you think of powerhouse college basketball programs, Northwestern isn’t necessarily a name that comes to mind. That’s exactly why they should enter a team in TBT 2019. Despite the lack of accolades, the gritty Midwest staple has produced several notable ballers over the years. The Wildcats are also just a year removed from their first NCAA Tournament appearance in school history. After falling short with 120 Sports in TBT 2016, former Wildcat and current sports broadcaster Tim Doyle has no shortage of guys to choose from. Two that could potentially run the backcourt are Bryant McIntosh and Drew Crawford. A 6-foot-3 guard from Indiana, McIntosh graduated as one of the school’s best distributors of all time. As a sophomore, he broke Doyle’s single-season assist record (213) and finished his career with the most dimes in Wildcats history. Crawford is a basketball guru who has been around the game his whole life due to his father’s career as an NBA referee. At Northwestern, he was named 2010 Big Ten Freshman of the Year (media) and racked up 1,920 career points. 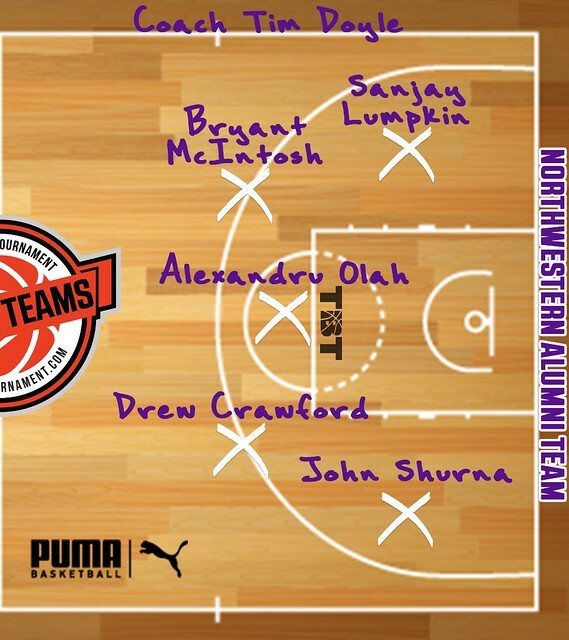 No discussion of Northwestern basketball is complete without Sanjay Lumpkin. The 6-foot-6 forward appeared in all 137 games for the Wildcats from 2012-2016 and served as captain his senior season. Joining him at the other forward is another guy who played a whole lot of games at Welsh-Ryan Arena. John Shurna was inducted into the Northwestern Hall of Fame in 2017 after finishing his college career as the program’s all-time leading scorer (2,038) and shot blocker (136). In his senior season, Shurna became the Wildcats’ first Big Ten scoring leader since 1951. It should come as no surprise that Shurna has had a standout career in Europe, most notably winning a Croatian League title with KK Cedevita in 2017. Who better to counter McGary in the post than 7-footer Alexandru Olah? The Romania native reached the 1,000-point plateau in his senior season in 2016, and competed for the Romanian national team in EuroBasket 2017. Olah currently suits up for Kangoeroes Basket Mechelen in Belgium.